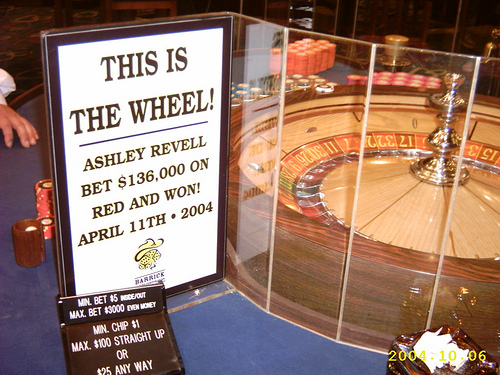 In 2004 the Brit Ashley Revell sold everything he owned and bet everything on Red on roulette and won. The bet was for a total of $135 300. The roulette ball is made from Delrin a thermoplastic that is also used in making the M16 rifle's stock. The longest recorded streak of one color in roulette in American casino history happened in 1943 when the color red won 32 consecutive times. Origin of the word roulette is from French word rouelle ‘wheel’ and from late Latin rotella 'wheel’. The marker used to show the winning number is called the ‘dolly’.